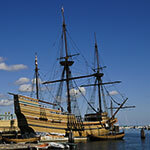 As the home state of Plymouth Rock and several critical sites of the American Revolution, Massachusetts is arguably among the most historic places in the United States. 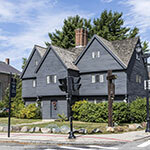 Historic hotels and other historic lodgings are numerous in MA. Many of these Colonial-era or 18th- and 19th-century hotels and inns boast period furnishings and owners who are more than happy to discuss the period with visitors. Most historic lodgings also are near locations of early gatherings and battles that helped form the United States. 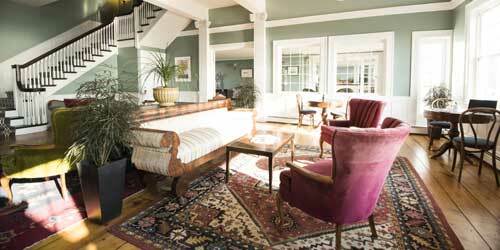 America’s past and a rural New England setting stir the soul at this historic landmark Inn. 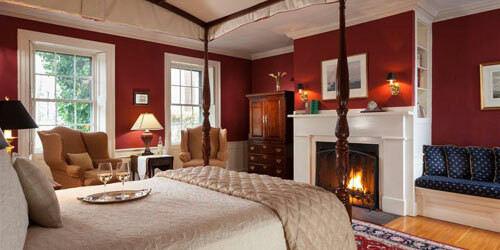 Yankee hospitality, homemade food and comfortable lodgings are just part of the 18th century ambiance. Spacious guest rooms and suites are alive with period antiques and reproductions in the Publick House Historic Inn and adjacent Chamberlain House with the Country Motor Lodge a short walk away through an apple orchard. Rooms offer air conditioning, cable television, private baths, wireless high speed Internet and complimentary toiletries. Traditional and casual Yankee fare from a light lunch to a more hearty meal, specialty drinks and desserts can be savored in the Tap Room and Ebenezer’s Tavern open seven days a week. Stop by for the gifts and goods turned out daily by the 18th century bake shoppe. Welcoming travelers since 1884, this historic inn is at the heart of the mile long Old Main Street in a National Historic Landmark village. 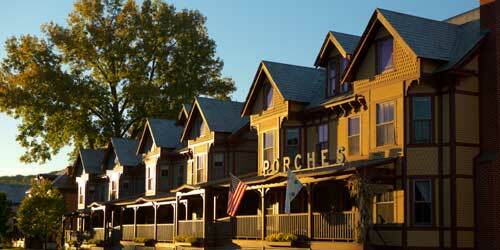 Yankee magazine says this is New England’s best 19th-century inn. Homes from the 18th and 19th century, many of them open to the public, line the street, along with working farms that provide much of the produce to our scratch kitchen. Cozy rooms are furnished with antique and period reproductions and comfy reading chairs, with the present-day pleasures of earth-friendly amenities, chamois robes and television. Enjoy classic favorites with a contemporary twist and local, seasonal produce in the inviting restaurant and tavern with their comfortable seating, fireplaces, and mahogany dining bar. 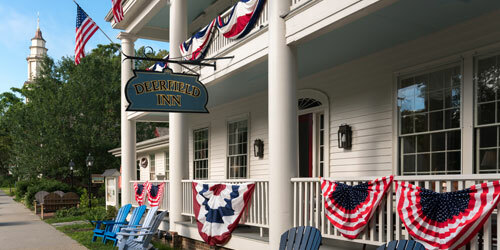 Historic Deerfield abounds in stories from our colonial past. Inventor/Industrialist George Westinghouse had planned for “100 acres of lawn..a velvet plain stretching to the horizon, unbroken, by paths, driveways shrubs, with perhaps only an occasional magnificent tree – an oak, an elm, or a great sycamore on it." On this land he built a late 19th century cottage for his wife, Marguerite. The land would change hands until 1977 when the property claimed its current incarnation, set on the 223-acre estate. The resort features 48 one and two bedroom condominiums with a master bathroom with Jacuzzi, kitchen, dining area, living area, deck, and fireplace. On site and off recreational activities abound as do the historic villages, homes, museums, Inns and taverns nearby - enough to fill a history buff’s curiosity and agenda for a long while. Relive America’s history – then sleep in. 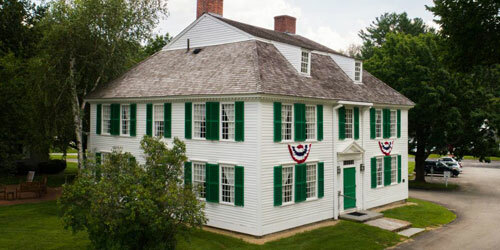 Celebrate America’s living history and settle in adjacent to the museum at the 10-room Oliver Wight House built in 1789 and listed on the National Register of Historic Places. Charmingly intimate, the rooms here and at the Reeder Family Lodges all feature free wireless internet and free continental breakfast. Oliver Wright House guests also enjoy queen-sized cherry four-poster canopy beds, embroidered bathrobes and slippers and adjoining room options for large parties. 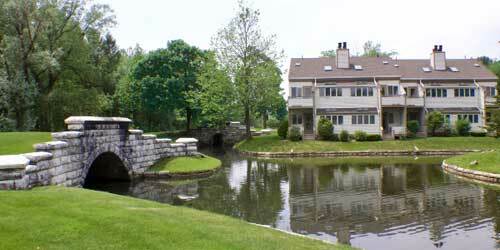 Enjoy a swimming pool, playground, and a collection of 19th-century toy and game baskets. All reservations come with discounted admission to OSV and there are special packages and discounts available to OSV members and for weddings and other select Village events. Signature Touch spa services are also now available at the cottages. The Emerson Inn, Cape Ann’s only grand bed and breakfast hotel overlooking the Atlantic Ocean, is a lovely historic waterfront resort with amenities for the perfect vacation, conference or wedding. 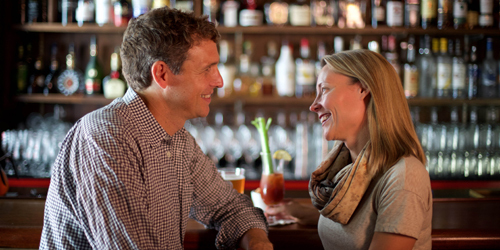 Appealing to everyone from romantic couples to families and corporate travelers, the inn offers 36 lovely guest rooms, fine dining in the Pigeon Cove Tavern, and full-service function capabilities. 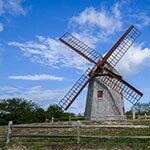 Adjacent cottages reveal ocean view accommodations with amenities for families, small corporate groups or reunions. Following years of renovations, The Emerson Inn offers today’s vacationers and business travelers a respite with the quality and legacy of America’s finest philosopher. Start with a 19th century downtown men’s haberdashery, now on the National Register of Historic Places, and furnish it with re-purposed things of older times, like wheeled garden carts and auditorium chairs, and you have the feel of past ages all around you. The Hotel on North, in the heart of Pittsfield, is surrounded by towns and countryside that has attracted vacationers for more than a century. The past is layered over the boutique hotel as exposed brick walls, hammered tin ceilings, and antiques chosen with an eye to whimsically mixing past and present. Step outside to visit and explore the homes and work places of 19th-century writers, sculptors and art collectors, and you will feel part of the history of a beloved New England region. Luxury and comfort in an historic setting! The Harbor Light Inn, among the Ten Most Romantic Inns in America, is set in one of America’s Ten Most Beautiful Small Towns. 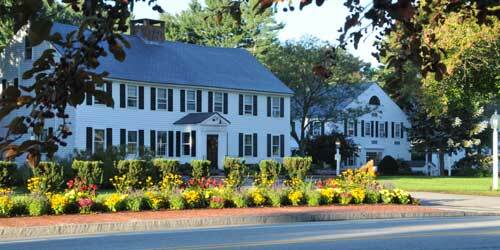 Near the harbor district and the birthplace of the Navy, the Inn consists of two Federalist mansions joined together. Luxurious rooms are equipped with private baths, DVD players, WIFI, fireplaces, Jacuzzis and additional amenities for your comfort and pleasure. An extensive continental breakfast buffet is included along with afternoon tea, coffee and cordials. The inn’s popular Tavern serves fine wines, beers and cordials and local favorites like chowder, crab cakes, shrimp, and grilled panini. Within short walking distance, you’ll find shops, galleries, art organizations, museums and historic buildings and sites and a wide variety of casual and fine dining establishments. Elegance has been its style, while a history rich in name and detail has been its calling card since 1912. 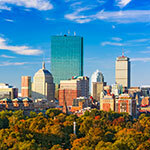 Today it holds the AAA Four Diamond Award as a centrally located, Back Bay luxury hotel in the midst of popular historic sites and celebrated boutiques on Newbury Street. Unparalleled comfort and superb amenities blend with the rich colors of the 383 newly renovated and culturally themed guestrooms and suites with high speed internet access, Keurig or espresso coffee maker, LCD flat screen TV, on-demand movie selections and windows that open. Plan a romantic getaway, a wedding, special event or meeting and discover how the times may have changed, but the essence of a great hotel never does. The 47-room Inn decorated in “granny chic” is directly across the street from the internationally renowned Massachusetts Museum of Contemporary Art. Set in newly restored Victorian row houses, it features long verandas, bold outside spaces, and interiors that mix striking, colorful style with homage to the buildings’19th Century heritage. Spaces are filled with retro furniture and collectibles from vintage plates and paint-by-number pictures framed on the walls, to vintage TV lamps. No two rooms are alike and the comforts are everywhere from lofts and/or spiral staircases. separate living rooms, working fireplaces, to private slate floored baths with Jacuzzi, claw foot tubs, and separate shower stalls. There’s complimentary continental breakfast, a heated outdoor pool, fitness center and lobby bar. The Red Lion Inn is one of the original Historic Hotels of America and one of the few New England Inns built before 1800 that is still operating. Located at the center of the village of Stockbridge and immortalized in Norman Rockwell's painting, "Stockbridge Main Street at Christmas,” the inn has hosted five presidents and notable figures including Nathaniel Hawthorne, William Cullen Bryant and Henry Wadsworth Longfellow. 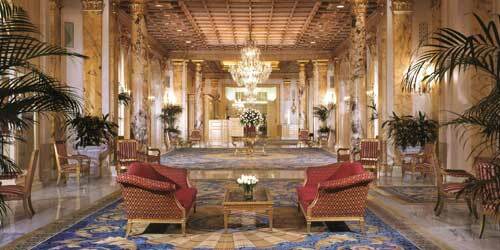 Its 125 guest rooms and common areas showcase early American furnishings and china. 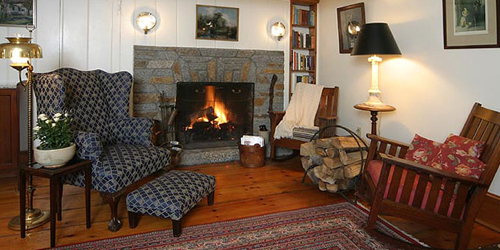 Amenities include outstanding cuisine, a fitness room, spa, a library and reading room, a wide porch with rocking chairs, a gift shop, and nightly entertainment at the Lion’s Den. 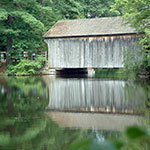 Nearby are many of the Berkshires’ popular cultural and outdoor attractions. Built in 1790 by a sea captain for one of his sons, the charming Tuck Inn on the tip of Cape Ann still celebrates that sense of family – and that connection to a storied past. Welcome hospitality from the innkeepers and staff is as warm as each morning’s homemade breakfast. 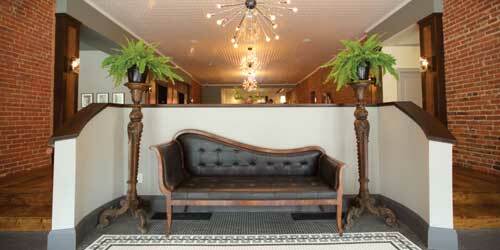 The comfortable rooms are filled with antiques and reproduction furniture. And a short stroll into Rockport’s village center lets you admire architecture dating back to before the Revolution and historic sites as well as views of the Atlantic, the lifeblood of this lovely coastal town. Nearby are lighthouses and, in Gloucester, the famous Fishermen’s Memorial statue, celebrating the area’s maritime history.